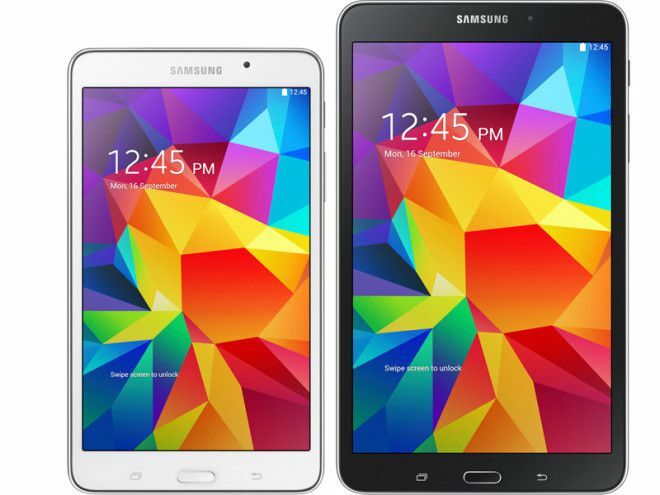 Today, Samsung took the wraps off its fourth generation Galaxy Tab(s). And it’ll be available in three different sizes: 7.0, 8.0 and 10.1 inch models will all be available to pre-order from tomorrow. Pricing is scaled to reflect the different sizes, with the 10.1-inch model being most expensive at $349 while the 8-inch and 7-inch models will set you back $269 and $199 respectively. The 8-inch model features a 1280×800 resolution display, a 1.2GHz quad-core processor, 16GB storage and 1.5GB RAM, plus a rear 3MP camera and 1.3MP front facing shooter. On the software-side, it runs Android 4.4 KitKat and will be kept going by a 4450mAh battery. We’ll keep you updated on pricing and availability when we get it. It’s not the Galaxy Note 10.1 2014 but I’ll check it out. Wait, they won’t offer the 10.1? Guess I’ll go to Best Buy. No. Changed my mind. I want the GN10.1. This won’t do spec wise. Junk 10.1 tablet with a sad 149 ppi display. It does beat my first gen iPad’s 132 ppi, but not by much. Not worth the $350 asking price. Perhaps at $200 it would be worth considering. @PiCASSiMO are you aware you are providing a link of specs to a tablet that was released 3 years ago? Everyone knows the iPad really shines not in specs, but in app support. Android’s up there with iOS on the phone front now for apps, but the tablet scene is terrible, its all sized up phone apps. No changes to the Galaxy Note 4 10.1 still with old-school 149ppi. Sad. And for the record, the iPad is collecting dust as I use my daily rooted/CM10.2 Nook HD+. If you have an IPAD and are happy with it why do you care about the Tab 4? Nope… the rooted/CM10.2 Nook HD+ keeps me company. iPad is with the 2 and 4-year old boys. Sad to see a 4th generation Tab 10.1 which still has the pathetic 149ppi with a $350 price tag. Thank you, tmonews moderators, for deleting my comment regarding the poor PPI on these new tablets that included true source of information from Samsung’s website. Did it occur to you that maybe, just maybe because you included a link in your original post that it went into moderation awaiting approval rather than being deleted? Way to jump to an assumption. BTW…if a comment is deleted you will see “this comment was deleted”. I was gonna buy Nexus 7 but if same pricing, i think the TWiz would be better for the kids since there use Sammy’s…..
All New Buyers of anything Samsung Galaxy should know that there’s a SAMSUNG EXPERIENCE SHOP inside of mostly every BestBuy where you can find free TECH SUPPORT (No appointment needed) and also offer FREE TRAINING WORKSHOPS to educate customers the advantages of owning a Galaxy device and how to properly use all the features to it’ full potential. Unfortunately Best Buy doesn’t finance any phones or tablets for T mobile but you can still go in for the Workshops or just incase you need any help. Workshops ate every Monday, Thursday and Saturdays from 1pm to 2pm, Call your local best buy for more info. Shill? I’ve been a T mobile customer since 05′ and use to be a rep in 2011 and 2013, What’s so bad about informing customers about Free Samsung Support that no one ever mentions but can come in handy for mostly everyone? you’re a paid shill, lurking the intweb for samsung articles. Ok sure I guess that’ll make you a woft. I am glad he post this,I don’t think too many people knew about this. I have Gal.Tab Plus,that is display model,I can’t down load anything from market with it. Will be checking this for sure. Thanks again. T-Mobile version Samsung tablets have better spec than Wi-Fi only counterparts. No 12.2 Galaxy Tab or Note ? Boo T-MOBILE US is slacking in size variables! (Not that I care about Samsung.) Sure T-MOBILE US delivers the most innovated plans the world has ever seen, however where is the variable products to back it up!? i want a windows tab;et like the dell venue 8 pro on this tablet network! any rumors of anything like that?